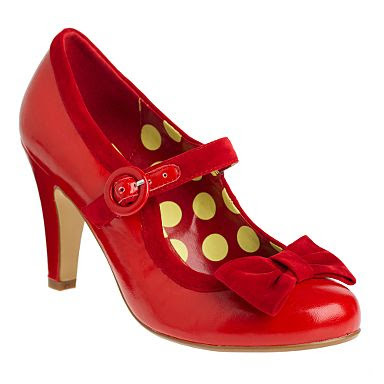 My only problem with Red Herring shoes is that there's so many that I like and they're so affordable, that I am always in severe danger of buying them all. Which is why I wasted The Hairy Drummer's lunch hour the other day making him help me decide which one pair to buy. In hindsight, these were a complete no brainer for me. Red? Check. M-J strap? Check. Bow in contrasting fabric? Check. Cute polka dot interior? Check. Almost all the things I love in one shoe? Check. Less than £30? Check. I also like that they're cute enough to be casual but not so cute that you couldn't wear them for work. I adore Red Herring shoes. in the last Debenhams sale i got 2 pairs of the same shoe because they were reduced to £20 a pair and that meant i would get more wear out of them. Wow! I'm a huge fan of Redherring too (and struggle not to feature them at least once a week on Shoewawa) but I hadn't seen these till now and think they're utterly fab! Well *ahem* spotted!